MOR at the CMCA Conference June 8-9, 2018 Word of the Week – You Prayed Now What? This has been a season of work and of preparation for Making Others Righteous Prison Ministry as we prepare for a busy Fall. We did get to visit Rio Cobre Juvenile Detention in Kingston, Jamaica where Pastor Omar performed inspirational Christian rap and poetry and gave away books to the young men of Jamaica on August 11, 2018. 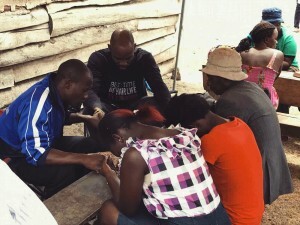 We were also blessed to visit the Austin Baptist Chapel Angel House which is a soup kitchen in Austin, TX. 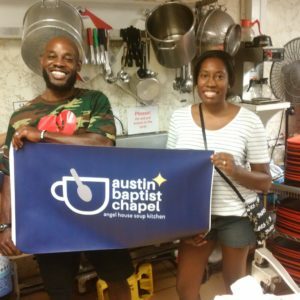 On September 2, 2018 Pastor Omar Fisher preached a powerful word and then Omar and Nicole rolled up their sleeves and served over 300 of the less fortunate of Austin, TX. Preparations have also been made for future prison visits. We will be visiting the Riverbend Maximum Security Facility in Nashville, TN on September 30th for a ministry event. Pastor Omar, Michael Barnes, and Bianca Sperduti will also be visiting the State Correctional Institution at Rockview in central Pennsylvania for the third time as the headliners for their week-long Gospel celebration on October 7th and 8th. We will also be having our first public fundraiser of the year at the Our House Cultural Center on September 13, 2018 @ 7pm. 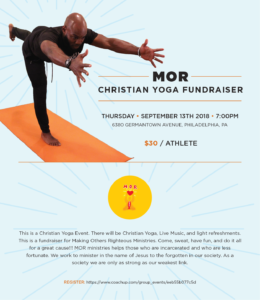 We will be doing Christian yoga to live music and raising money for the ministry. Fun, Food, Faith, and Fitness…what more could you want! !